Tacky Glue . This is my multi-purpose glue. I like using this more than Elmer’s multi-purpose glue that I used in elementary school. I like Tacky glue because it is thicker and when it dries, it doesn’t wrinkle the paper so much. Also, it doesn’t dry as stiff either. Glue stic . Avery is my favorite brand. Acid-free and permanent. It is easy to wash out of clothes. Not mine. My kids’. Elle loves playing with these because I have them all over the house. Mod Podge . It is a sealant, it is a glue, it is everything you want it to be. It comes in so many different forms – matte, glossy, satin, glittered, shimmered. Glue gun . I like that this is a fast drying glue. Some times a little too quick. And it is a strong glue. Great for fabrics and home decor projects. Diamond glaze . My favorite glue to when its clarity is important. I used this to make the glass pendant necklaces. 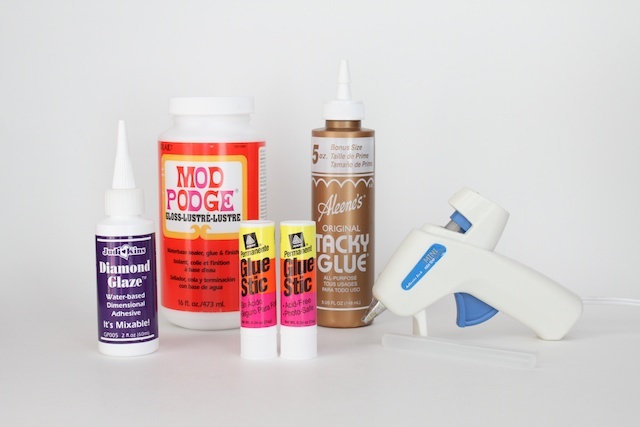 » Tell me… What is your favorite glue to craft with? Glue gun, all the way baby. I use that little pistol for just about everything! My go-to-glue used to be Tacky Glue, until I discovered PVA (stands for poly vinyl acetate). Sounds like a chemical nightmare, but it is absolutely the best glue for paper and fabric projects because it flexes (it’s similar to Modge Podge) Its the same stuff they use to make notepads (heck, its how you can DIY your own!). Its great for scrapbooking because it allows your paper to remain flexible instead of hardening wherever you glue stuff to it. Just apply with a sponge brush and you’re good to go. I buy mine at Paper Source, but I’m sure most craft stores would have it as well. I love diamond glaze but it is so hard to get hold of here in NZ and postage costs are rising so may have to try stampin ups version. I use the Glue gun and Modpodge. I also use Helmas Acid free glue. Detest glue sticks as I haven’t found one in NZ yet that holds anything together for a decent amount of time. I do however use tape runner adheasives.Still deciding which I like better. I’m only six months late on posting a reply, but I couldn’t resist because I love my adhesives so much. 😉 I LOVE glue dots. Gotta have ’em. Oooh I love all those glues, although I haven’t tried Tacky Glue yet but really want too. A glue I just discovered and is the BEST is E-6000 it’s the strongest glue i’ve found. Better than any two part epoxy. I glued a plate to a candlestick for a cupcake stand with it and it’s solid as a rock!